I'm not really. That was just the subject header for one of those dodgy "we've got lots of money to send you from Nigeria, but we just need to borrow your bank details and your first born child for a little while before we give it to you" emails that I received in my inbox this morning. Honestly, where do they come up with these names? Is there some sort of random name generator out there that provides apparently trustworthy names for dodgy email scams? They are incredibly annoying, but I'm not going to let them beat me. From now on, all my sock monkeys will be receiving dodgy scam email names. Meet Jean-Marc Chapuis on the left and Darlene Grace on the right. George, in the middle, went to a lovely new home on Saturday. Take that you annoying email scam people! Ha ha, I receive heaps of those too, annoying huh! Love that you're turning it around! Priceless! Except now you need to keep getting the emails so you don't run out of names. That is simply the most excellent idea I have ever heard! Yes I do get emails like that every now and again too... so far 3 from Darlene Grace. 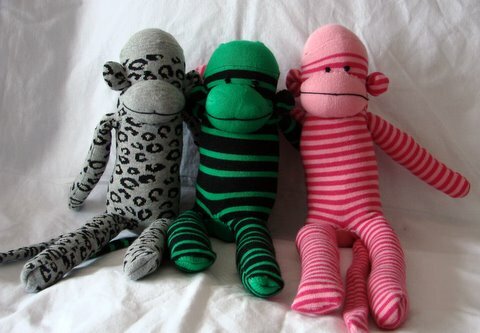 I bet there are some very happy people in those monkeys' new homes! :) Those are awesome!